BookMacster 2.9.1 – Organize and manage bookmarks, sync across browsers. Implemented some means to reduce errors 3025, 303025, 106842. Changed tab label, which had been Agents for many years, and was changed to Syncers in the last version, to the more sensible Syncing. Improved operation of the menu item Log Sync Watches to Clipboard which was introduced in Version 2.9, changing its title to Show Syncing Status. Fixed bugs in and improved operation of the Stop All Syncing and Reboot Sync Agent menu items. Fixed a bug introduced in version 2.9.0 which caused Error 812002 and failure to sync if user, typically a new user, installed the BookMacster Sync extension into Firefox, Vivaldi, Opera or Google Chrome and then switched on syncing before ever editing bookmarks in that browser. When BkmxAgent operating in the background fails to open a Collection, no longer removes tells app to "forget" that Collection, and no longer advises user. This will be done next time the user launches the application. Most of the Help Book, except screenshots, is now updated to reflect the big change made in Version 2.9. Eliminated growth in memory usage over time by the sync agent (BkmxAgent) which was introduced in Version 2.9. Next story Amadeus Pro 2.5.0 (2047) – Multitrack sound recorder/editor with MP3 support. Previous story Studies 1.5.3 – Flashcards for serious students. Thumbtack 2.3 – Easy access to your Pinboard bookmarks. 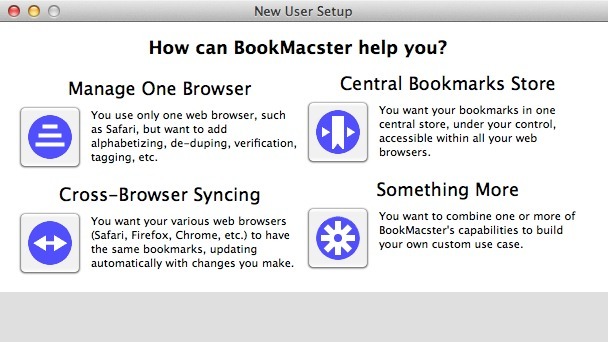 BookMacster 2.7.1 – Organize and manage bookmarks, sync across browsers. BookMacster 1.22.26 – Organize and manage bookmarks, sync across browsers.